Casey Neistat has created some great bike videos. Funny video and he makes his point, but I'd like to see all the same scenarios with a "real" lock, like an Abus Granite or Kryptonite New York Fahgettaboudit. Does anyone who rides beyond the month of May really use such a flimsy lock and chain? I don't think so. Well done. (Fight the ticket). HP Velotechnik's Moonbiker panniers are not designed for the Gekko fx. Instead, use the nearly identical "Side Panniers Large" for mesh seats made by Radical Design ("RD") (Netherlands). You can buy them from New York City Recumbent Supply. Note that the Radical Design panniers are made in three formats: for hardshell seats (like the HPV BodyLink seat), for mesh seats (like the Ergo Mesh seat) and "banana" (universal fit, for hardshell or mesh seats). Be sure to order the correct one! 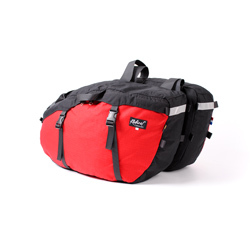 The RD panniers are made from cordura nylon that is coated for water resistance, are very durable, and are lighter weight than most other options for panniers. They also come in five saturated colors and with reflective tape for nighttime visibility. I've used them on several multi-day rides and like them quite a bit.